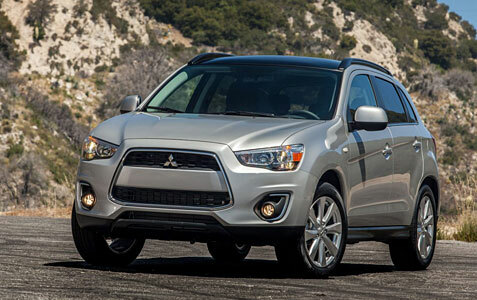 For the 2015 model year Mitsubishi has updated its perennial best-seller with some aesthetic changes and engineering improvements to this sporty compact crossover. I tested the SE model with all-wheel drive for a week and came away impressed with what the vehicle offered for the price. The 2015 Outlander gets new, stylish-looking LED running lights in the SE model but otherwise the exterior design remains unchanged, which isn’t a bad thing as the Outlander’s exterior works for a sporty but practical crossover. I like the front end and the vehicle looks great from every angle. The Ruby Red version we tested looked particularly sharp, and I like it in the other offered colors including the blue model pictured here. It has the type of look that should be appealing across a wide variety of consumer groups as the designers haven’t tried to get too cute with any aspect of the design. The Mitsubishi Outlander has been in the market for a few years now, and the one thing that you can count on is this vehicle getting better with every model year. We tested the redesigned 2014 Mitsubishi Outlander Sport SE and really didn’t know what to expect at first, but after a week behind the wheel, we found a solid vehicle at a reasonable price. 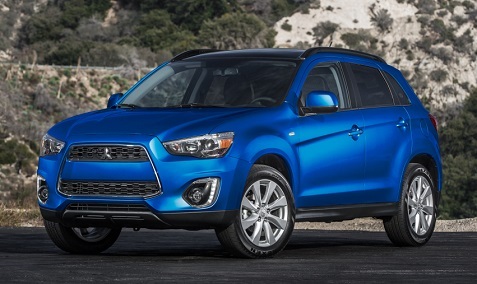 The new 2014 Mitsubishi Outlander Sport SE has sharp looks with an edgy design. Our rally red test model looked uncluttered and sleek for a SUV that is generally better known for utility advances. The 18-inch alloy wheels, super-wide HID headlights, chrome front grille surround, chrome belt line molding, fog lights, rear LED tail lights, rear spoiler and exhaust finisher spiced up the overall appearance. 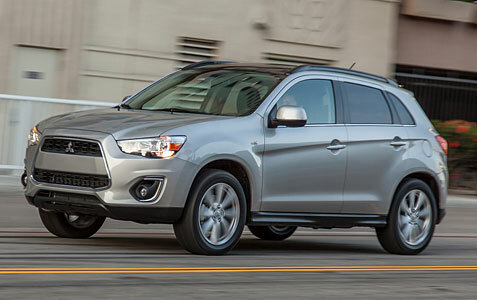 The look of the 2014 Mitsubishi Outlander Sport SE is practical and smart. Don’t look for luxury to be in the vocabulary when you’re driving a $25,820 as tested SUV, but roominess will fall right into place. Standard features such as climate control, air conditioning, leather wrapped steering wheel and shift knob, high contrast meters and full color multi-information display were well thought out and placed. We also thought the 710w Rockford Fosgate Premium sound system with nine speakers was high quality and powerful. Cabin and utility space are solid without needless gadgets that can get in your way. It’s not easy to pack the punch of a sports car into a four-door sedan while keeping the price reasonable for the general public. But Mitsubishi did just that with the 2014 Lancer Evolution GSR, and after a week of testing, there is no doubt that the Lancer Evolution can run the streets with the best of them out there! The large, rear wing spoiler on the 2014 Lancer Evolution GSR is definitely old school and adds so much style with something so simple. But so much of what you see on the Lancer Evolution GSR isn’t just for looks, but for performance as well. Further aiding the tractability cause is a set of highly adhesive 245/40R18 low-profile Yokohama Advan asymmetrical performance tires clad to lightweight 18-in. x 8.5-in. wheels with the Lancer Evolution GSR model wearing Enkei cast-alloy rims. Also adding to the sleek exterior are flared fenders, aluminum roof panel, aluminum front fenders with vents and aluminum hood with hear extractor vents. The best way to describe the interior of the 2014 Lancer Evolution GSR is modern with no frills! That’s not to say that the latest technology and comfort features aren’t present, but even with all of those extras, there is no mistaken that this car is about performance. Our test model was loaded with recaro black leather seats, power glass sunroof, heated front seats, center console upgrade, sound dampening enhancement, auto A/C with micron filter, leather-wrapped steering wheel and shift knob, high contrast sport meter gauges, color multi-information display, steering wheel-mounted cruise control and audio switches, 6.1-inch touchscreen display audio and Fuse hands-free link system with USB port. The seats are strong, but being the larger person that I am, they felt a bit small and uncomfortable at times. When designers put finishing touches on a car, they can only hope that a compact sports sedan can accomplish what the 2013 Mitsubishi Lancer GT 2.4L has achieved in creating an extraordinary 4-door available in several different iterations to fit just about any need or lifestyle. We found this out first-hand while testing the sleek offering from Mitsubishi. 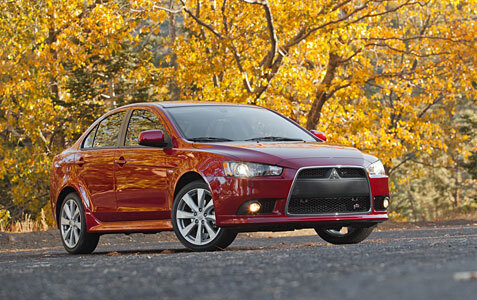 Great looks is always a smart starting point for any vehicle, and the Lancer GT totally nailed it! 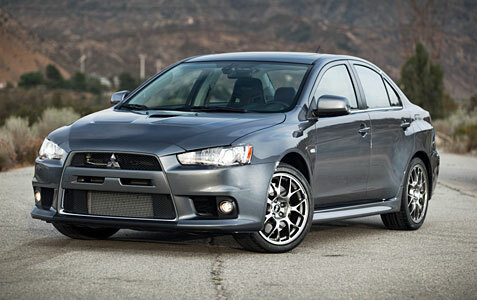 The chassis design of the 2013 Mitsubishi Lancer is so robust and well-engineered that it serves as the foundation for not only the popular Mitsubishi Outlander crossover utility vehicle (CUV), but also the multiple-time World Rally Championship (WRC) title holder Lancer Evolution, the ultra-high performance turbocharged sports sedan that has a worldwide fan following. The 18-inch alloy wheels and more aggressive front fascia really take the GT model to a whole new level of attractiveness. The 2013 Mitsubishi Lancer is available in six eye-popping colors: Wicked White, Apex Silver Metallic, Mercury Gray Pearl, Rally Red, Cosmic Blue (new for 2013), and Tarmac Black Pearl. Our Mercury Gray loaner had flawless paint, which looked amazing both day and night. High on style and features yet low on price, the 2013 Lancer has a vast array of welcome features and amenities that are included as standard, such as a fuel-saving Electric Power Steering (EPS); 140-watt AM/FM/CD/MP3 audio system with Digital Signal Processing (DSP) control and 4 speakers; speed compensated volume and equalization control; remote keyless entry and anti-theft engine immobilizer; power door locks and mirrors with driver-side auto up/down; 4-way adjustable driver’s seat; a tilt-adjusted steering column; and a convenient 12-volt power outlet in the center console, which is perfect for recharging a handheld GPS unit or cell phone. Mixing both refinement and all-out performance, the 2013 Mitsubishi Lancer GT pampers their occupants with upscale touches and available accessories while also offering the enthusiast driver unrivaled sports sedan athleticism. Other amenities on the 2013 Lancer GT include sport front bucket seats, automatic climate control, a dynamic 6-speaker audio system, Mitsubishi’s FAST-key with panic feature and leather-wrapped steering wheel and shift knob. The sharp looking Outlander Sport Limited Edition compact crossover was a great choice to commemorate the 30th anniversary of Mitsubishi Motors entering the North American marketplace. Our laguna blue test model was very sleek and sporty and stood out from the crowd. Mitsubishi designers and engineers have given the 2014 Outlander a fresh, contemporary face that is both appealing and functional with reduced aerodynamic drag. Further aiding fuel economy is a lightweight body that tips the scales approximately 200 pounds less than that of the outgoing Outlander – all while providing a high level of collision safety and structural rigidity through use of high-tensile steel. Manufactured at the company’s automobile assembly plant in America’s heartland in Normal, Illinois, the 2013 Outlander Sport Limited Edition makes quite a visual statement with its distinctly ominous look, thanks to its blackout side mirrors, center bumper, wheel arch trim and roof rails, accompanied by special argent Limited Edition alloy wheels. Rounding out this exquisitely styled package is special “Limited Edition” badging, black roof rails, front bumper with black center, black side view mirrors, black wheel arch moldings, 18-inch alloy wheels with chrome finish, super wide range and HID headlights. With its sleek, new interior design direction and high-quality cabin materials, the all-new 2014 Outlander is an affordably priced crossover that is an ideal vehicle for the cost conscience automotive consumer. The 2014 Outlander’s new interior design emphasizes ergonomics, aesthetics, comfort and quality. From the new soft-touch instrument panel, to the eye-catching gloss black center waterfall, to the lovely wood grain trim, the interior of this handsome crossover exudes opulence. In addition to the 2014 Mitsubishi Outlander’s long list of welcome standard amenities, our Limited Edition (LE) model sported features like a next-generation navigation system, a state-of-the-art 710-watt Rockford-Fosgate sound system, the latest version of Mitsubishi’s extraordinary Super All Wheel Control (S-AWC) all-wheel drive system, power driver’s seat, heated front seats, rear camera system, engine switch with chrome accent, Fuse hands free link system with USB port, one-touch engine start and stop, fast key entry system, steering wheel mounted paddle shifters, full color multi information display, ECO driver indicator lamp, rain sensing wipers, leather wrapped steering wheel, leather wrapped shift knob, keyless entry with panic alarm and much more.